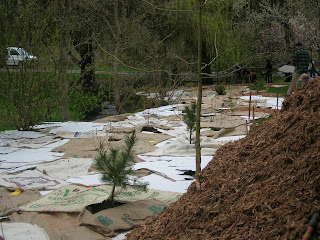 Little Swamp Creek: An Amazing Planting Day, thanks to The LEAF School & Adopt-A-Stream!! 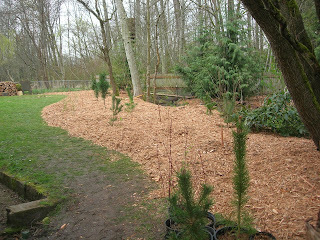 An Amazing Planting Day, thanks to The LEAF School & Adopt-A-Stream!! Today was the big day - Adopt-A-Stream and The LEAF School from Edmonds Community College came for the afternoon to plant and mulch the east side of the stretch of Little Swamp Creek that flows through our yard. We are so thoroughly impressed with the wonderful students who spent their afternoon here. I did not think that the whole job would be done by the time they had to leave, but it sure was! Thanks so much, guys! The Adopt-A-Stream elves (thanks Loren, Sarah, Jennifer, CK, & John!) had placed all of the 100+ plants where they needed to be, so we started the afternoon with a lesson on how to properly plant the plants and then got down to it! 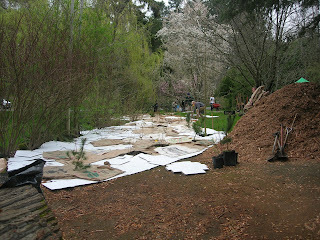 The plan was to plant the plants by digging their holes in the existing lawn/sod and covering all of the sod around the plants with a layer of coffee bags as a weed block and a putting a mulch of coarse wood chips on top of that. 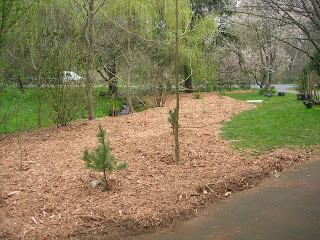 This is looking toward the back of our lot, with the planting just about finished. 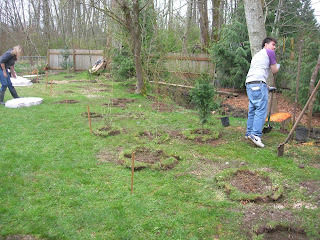 (The circles of sod removed for the planting holes were used to make a ring around the plants...) Eric and I had marked the border of the planting/mulch area with wood stakes. Just the other day Eric happened upon a man at the garbage/transfer station who was trying to get rid of literally a ton of unused, flat cardboard boxes that were in a storage unit that this man had recently purchased. The transfer station wouldn't take all of this cardboard, but Eric took a BUNCH. 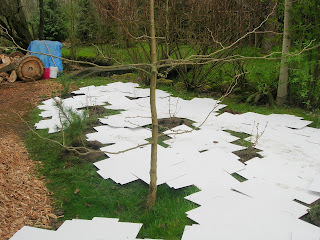 Luckily we ended up using almost all of them as a weed block under the mulch, because it ended up being a LOT of boxes to use up any other way. 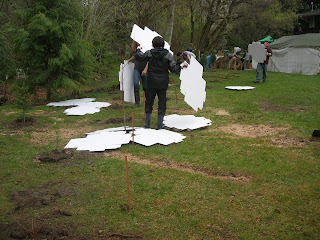 The flat boxes looked like large puzzle pieces being laid out on the ground. The cardboard box weed barrier. 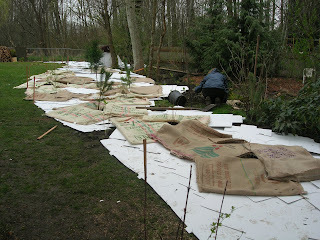 The coffee bags (made out of coconut fiber) were laid out on top of the boxes. I am glad that we had the box layer, because it makes me even more confident that the sod will get smothered! This is again looking toward the back of our lot. This is looking towards the street/front of our lot. The coffee bag layer was going on top of the cardboard boxes. Another view of the weed barrier in progress. 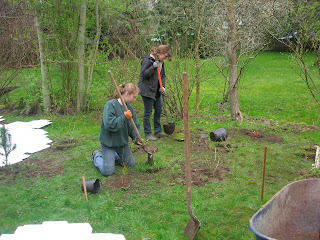 The trick, of course, was to make sure that the weed barrier (and mulch) didn't end up too close to the individual plants. 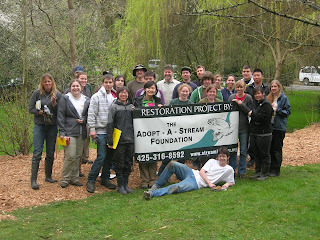 And here is our amazing LEAF School planting crew along with the Adopt -A-Stream folks! Their instructor, Thomas Murphy, is in the middle, back row. What a great group of people! Thanks again to all of you!! Thanks, Valerie. And thanks for being a Follower!! It will be fun to keep you updated on your work here!